Sometimes everyone just wants something different for dessert. This happens a lot at my house. 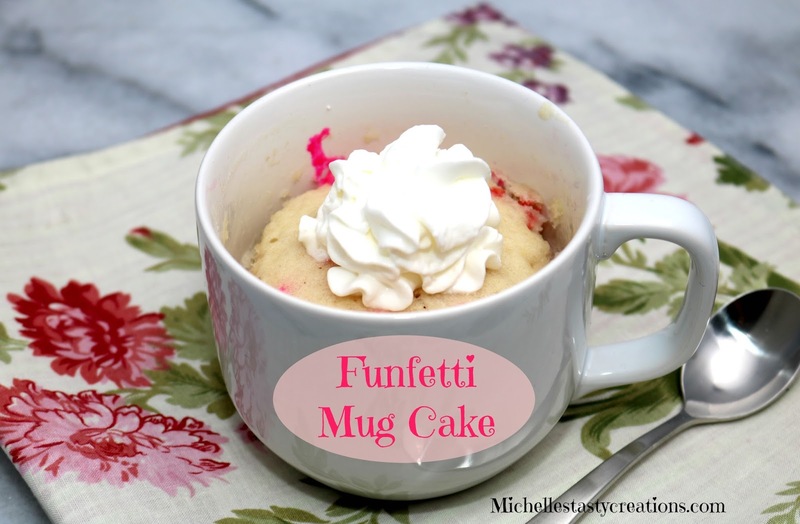 I love these mug cakes because you can adapt them however you like; fresh fruit, funfetti, chocolate chips, etc. These work in most sized mugs. Just be SURE it is microwaveable whether it's pottery, glass, or plastic. I actually went a got a few smaller (regular) sized mugs because most of mine are huge! Mix all ingredients except the sprinkles in the microwaveable mug you are going to use making sure to incorporate all the cake mix. Add the sprinkles and mix well. Microwave for 90 seconds. All microwaves are different wattages so start with about 70 seconds and see if it is done. Add more time if needed. Mine took 90 seconds. Cool a few minutes and top with whipped cream or ice cream and enjoy!